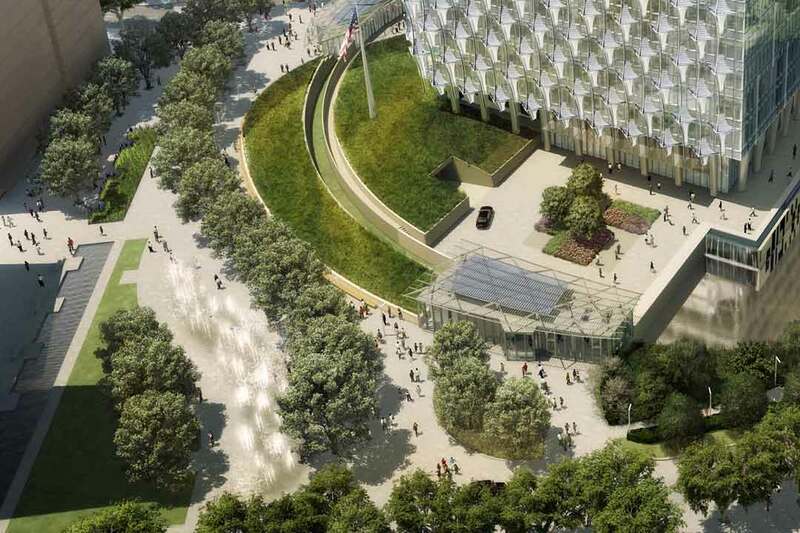 The State Department’s Overseas Building Operations (OBO) released new renderings by KieranTimberlake of the United States Embassy to be located near London’s Vauxhall neighborhood. 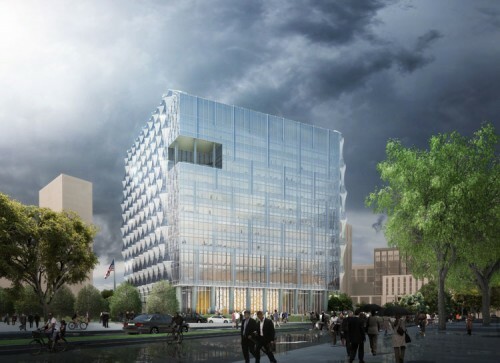 The project has acted as something of a petri dish for the development of OBO’s Design Excellence program, which was modeled on a similar program at the much-beleaguered GSA. The London project has been watch closely by federally commissioned architects who must comply with design requirements that combine energy efficiency, sustainably, intense security, and high design. “They continue to use this project as a test case for sorting that stuff out and to continue to achieve really high levels of refinement and design excellence,” concurred James Timberlake. 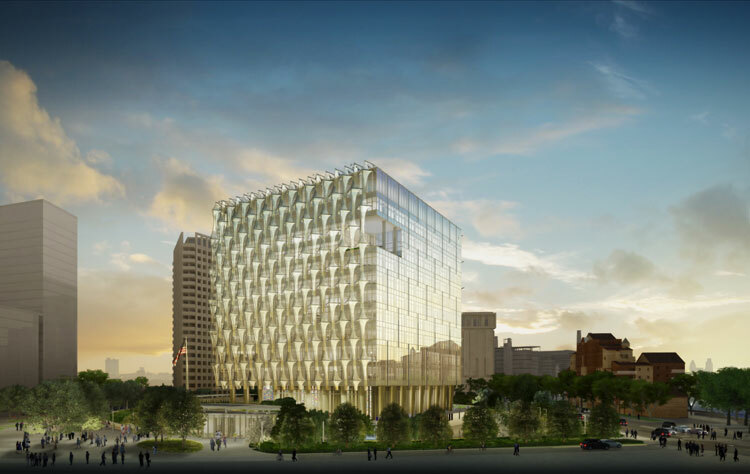 The embassy's multi-leveled perimeter, reflecting ponds, and landscaped barriers act as anti-ram deterrents. In a forerunner of efficient practices espoused by the policy, OBO sold their Saarinen-designed building in swanky Grosvenor Square, which in turn paid for the new building on the up-and-coming south side of the Thames. 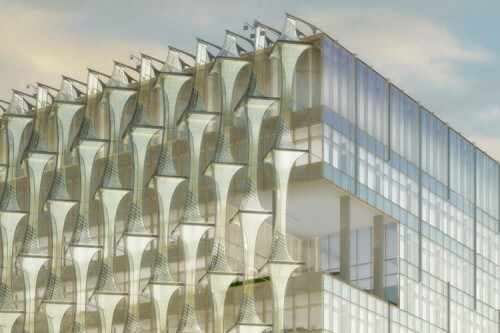 An OLIN-designed landscape incorporates anti-ram deterrents that the OBO guidelines officiously dub “Embassy Perimeter Improvement Concepts” or EPIC. “I wouldn’t call them barriers,” said Timberlake, who noted that despite offset and security setback requirements, 40 percent of the compound remains accessible to pedestrian traffic. 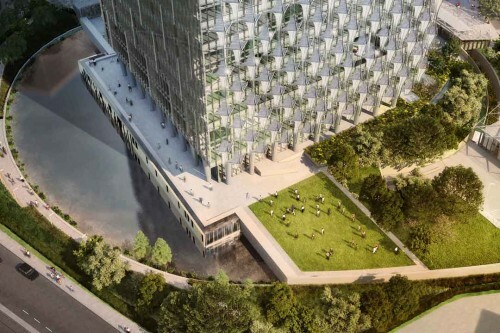 If anything, he said, many of the major refinements are through the building’s engagement with landscape, including water management in ponds that collect runoff for irrigational reuse, as well as for security. A detail of the struts and cables that hold the photovoltaics in place, creating a slightly convex curve. Certain technological advancements have insured that the highly efficient envelope incorporating photovoltaic technology will indeed go forward largely as planned. The rooftops of three entrance pavilions will also hold photovoltaic panels. But it is the envelope that has gone through the most rigorous analysis. An open outer structure acts as an ETFE shading element with a fritted layer that includes photovoltaic patches measuring 6 by 12 inches. Cast struts holds the cable stayed system apart from the glass box, bowing slightly at the midsection, giving the building a slight protrusion, like a proud, swollen chest. Three entrance pavilions include the photovoltaic panels on their rooftops. Seven interior and exterior gardens are distributed throughout the building with three cut into the cube, with one revealed on the north face.